Contrary to what you might believe, ensembleing dapper doesn't require that much effort. Just reach for a navy trenchcoat and Stone Island classic chino trousers and you'll look incredibly stylish. 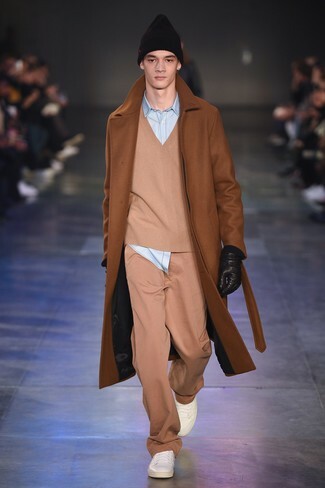 When it comes to footwear, this outfit is complemented nicely with dark brown leather casual boots. If you're on the hunt for a casual yet dapper outfit, team a navy field jacket with Stone Island classic chino trousers. Both pieces are totally comfortable and will look great together. 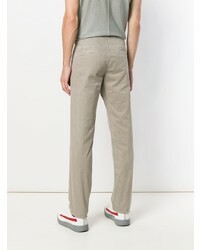 When it comes to shoes, this getup is complemented brilliantly with tobacco suede desert boots. 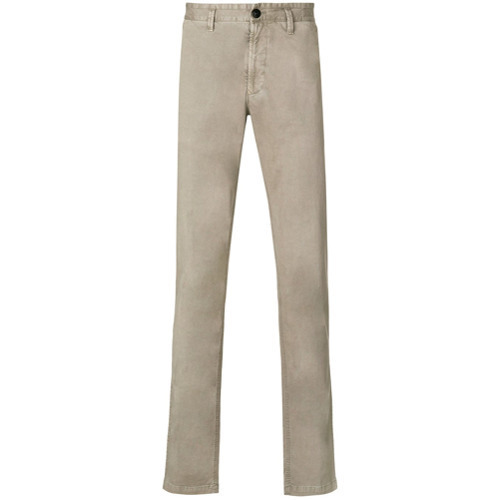 If you're looking for a casual yet seriously stylish outfit, consider teaming a blue v-neck sweater with Stone Island classic chino trousers. Both garments are totally comfortable and will look great paired together. Bring instant interest and excitement to your outfit with black leather oxford shoes. If you're on the lookout for a casual yet stylish outfit, try pairing an olive denim jacket with Stone Island classic chino trousers. Both garments are totally comfortable and will look great paired together. 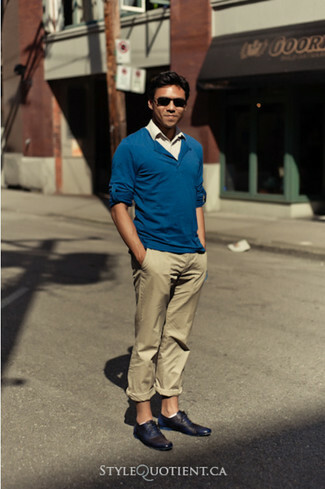 Brown suede derby shoes will instantly spruce up even the laziest of looks. 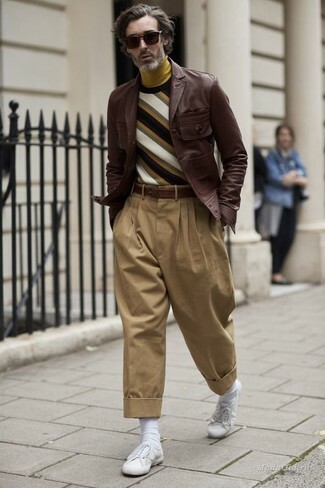 This combination of a tobacco overcoat and khaki chinos is so easy to make up without a second thought, helping you look dapper and ready for anything without spending too much time rummaging through your wardrobe. 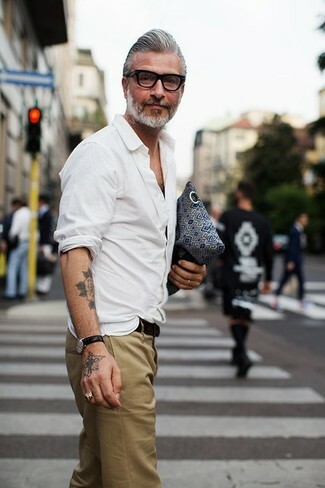 For something more on the daring side to finish off this look, throw in a pair of white leather low top sneakers. If you're looking for a casual yet sharp look, try pairing a white long sleeve shirt with Stone Island classic chino trousers. Both garments are totally comfortable and will look great together. 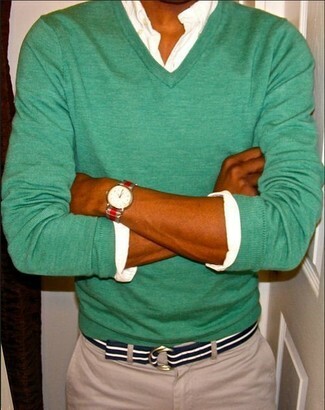 If you're in search of a casual yet stylish ensemble, consider teaming a green v-neck sweater with khaki chinos. Both items are totally comfortable and will look great paired together. 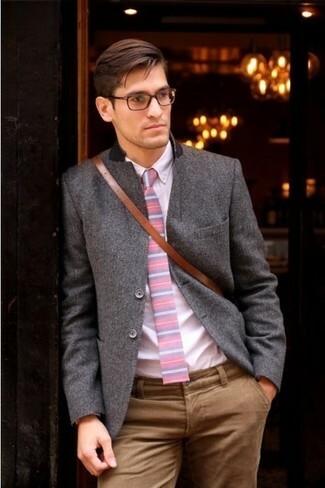 For a smart casual ensemble, pair a charcoal wool blazer with khaki chinos — these pieces fit perfectly together. Contrary to what you might believe, getuping on-trend doesn't take that much a work setting. 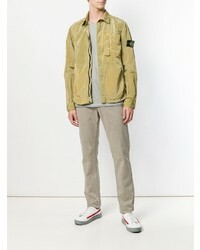 Just wear a dark brown leather shirt jacket and Stone Island classic chino trousers from farfetch.com and you'll look incredibly stylish. 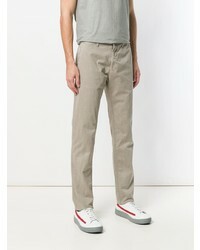 Make your getup more fun by completing it with white canvas low top sneakers.